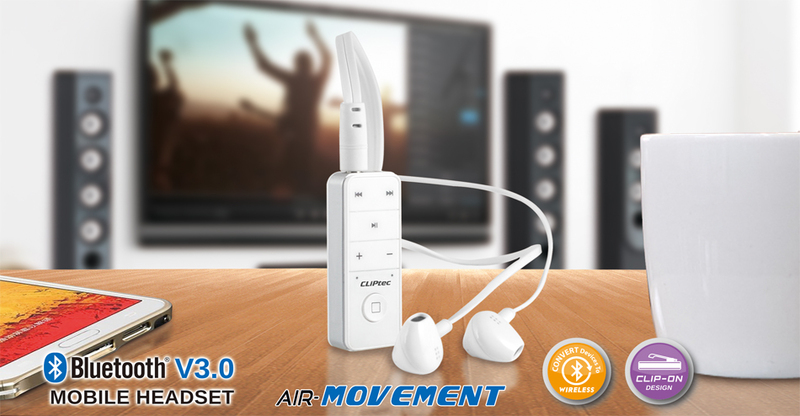 CLiPtec PBH210 Air-Movement is a Bluetooth V3.0 Stereo Headset that enable you to enjoy wireless music with great sound and crystal clear calls. It combines the advance technology and humanized design, only for your pleasure to enjoy a sound phone conversation and give you a little bit more to appreciate the essence of music. PBH210 enhanced with Multipoint Pairing Function (MPF), the upgrade of supports to connect with 2 mobile phones at the same time, it is easy to answer, reject, convert or keep your call if there is another incoming call for your mobile phone while you are in conversation. Built-in rechargeable battery provides up to 5 hours communication time and music playback on a single charge. Let you adjust the volume up/down, play/pause, switch tracks and answer calls on the device. You can plug your own earphone or headset into 3.5 mm audio port as you like.